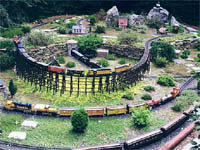 Garden Railways: The fastest growing garden hobby: We can design and build a Garden Railway of any size especially suited to your yard and budget. From a telephone consult to a fully installed “turnkey” operation or any stage in between, We are the team to call. Beauty and Action what a combo! Oh my God, I'd love a railway in my garden! !